Paper clutter can quickly accelerate to the avalanche stage if there is no system to deal with it. Using the six-file fix, every piece of paper will have a place in the house -- and your affairs will be organized and clutter-free. Label your file folders. Name them as follows: 1) To Give Away; 2) To Be Read; 3) To Be Filed; 4) Bills; 5) Dated Information; 6) Unsure. Set a garbage can close enough to toss things into without moving. Sort the papers by category. The file marked "To Give Away" is for all the articles, recipes, notes and other things that you kept to share with someone else. All papers that you intend to share need to be put here, so that when you are going to see that person, you can get it to them and actually get rid of it. Put the papers you want to look over into the "To Be Read" folder. This is the place for credit card offers, church bulletins, club newsletters and car insurance quotes. You can grab this folder when you expect a long wait at the dentist, you're stuck inside not feeling your best, or you just have some downtime. File old bills, pay stubs, medical receipts, and car repairs into the "To Be Filed" folder. Anything that you want to keep for taxes or medical or school records go in here. 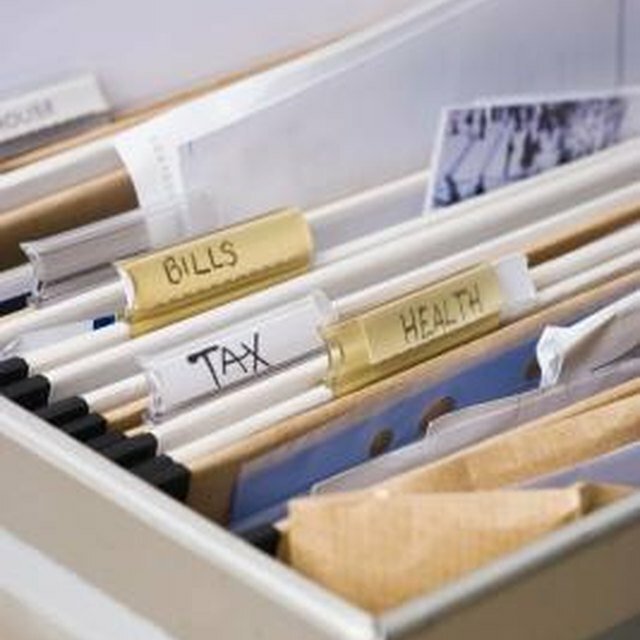 Use your "Bills" file folder only for the bills that you have not yet paid. When you sit down to pay bills, they will all be in one place. Once paid, put those that you need to save into the "To Be Filed" folder. Put things that have deadlines or expiration dates into the "Dated" file. Wedding invitations, school field trip information, car maintenance schedules and school finals schedules will go in here. These are the things you keep meaning to write down in a day planner or on a calendar. To keep these things from getting lost, put them in this file; then, when you grab your day planner or calendar, everything will be there. Use the "Unsure" file for anything you just can't bear to throw away but have no real use for. If you don't find a use for these after three months, toss them. Make the last file the garbage can. Think about what you are saving and unless it's an absolute can't-part-with "Unsure" item, toss it. It helps to cut clutter down a lot if you open your mail right next to the garbage can. If you get a daily newspaper, these are a terrible source of clutter, so make sure and toss them as soon as you're done with them. Read through this whole article once or twice before you start. How Do Silent Bank Alarms Work?